To me, there’s no scarier Final Jeopardy! category than STATE CAPITALS. Sure, maybe you memorized them all in third grade, and can list them alphabetically. But more often than any other category, I’m pretty sure, it’s some stupid wordplay clue that has little to do with geography. Where do you begin with clues like these? Do you start in the northwest with Olympia, work counterclockwise down the Pacific coast, then back up the Rockies? Before you know it, 30 seconds is up – and you haven’t even gotten close to the small states on the eastern seaboard. It’s far better to know some of this arcane trivia off the top of your head. 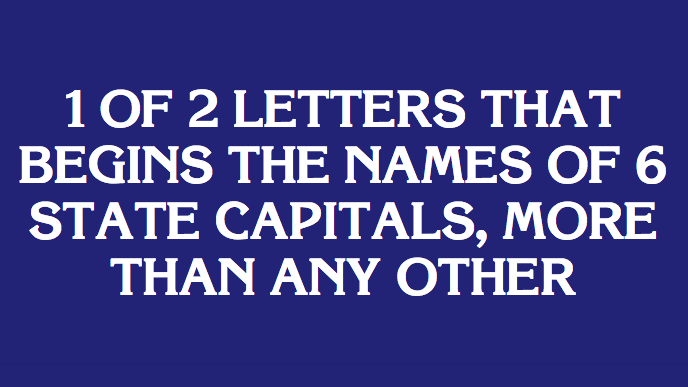 In that vein, I present some basic facts about the capitals – particularly their names. Many of these facts have been asked on Jeopardy! before, and I have little doubt they will be again. I also suggest you check out the list of etymologies compiled by Blogspot user Anthony1956 (in two parts: 1 and 2). Be sure to look at the rest of his site, too, as he has a lot of cool info on the names of various countries and other place around the world. I’ve written this with the correct responses in spoiler tags, so you can test your knowledge before looking at the (pointless but potentially lucrative) answers. Finally, I intend for this to be a ‘living’ list, so if there’s something you think is important that I haven’t added, please let me know and I’ll do so. Which body of Salt Water does Baton Rouge border? The Mississippi is gross at that point, but I wouldn’t call it salty. Had that one in there on a pointless technicality: there’s been significant salt-water intrusion underground, but not above-ground. I’ve removed it. Thanks for catching it! Always a favorite question: which two state capitals are named after men who were executed? Probably extremely late and you will never notice but Austin and Jackson?? Just a guess!